There are two types of people in the world: the ones who do their gift shopping ages in advance & the ones who are lazy last minute gifters. Which one are you? 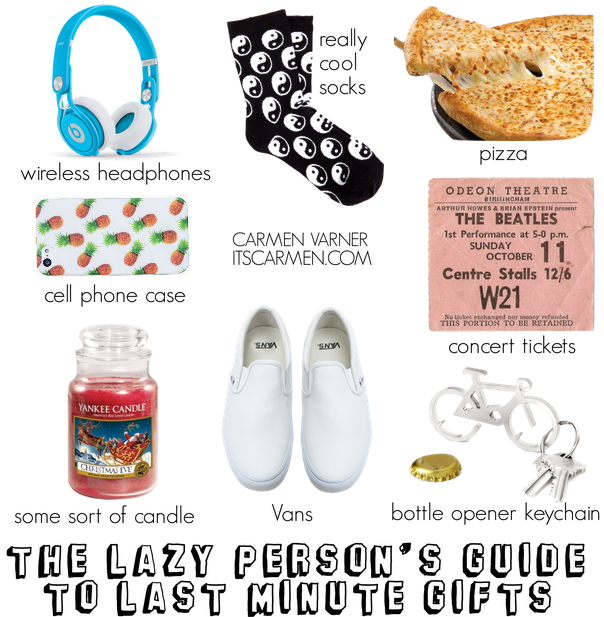 This post is all about the lazy person's guide to last minute gifts. These presents are useful enough that most human beings will want something or another. The best part is the items are generic so you can tailor it to whomever you're purchasing for. Haha you can never go wrong with pizza! & If only concert tickets were cheaper! This is such a fun and creative list! I'm all about the food vouchers, such a funny idea and I know many of my friends would definitely appreciate this gesture! I'm in the middle. Half of my presents are purchased early and half are last minute. Love the pizza idea! I got exactly the same Yankee candle that you got in the picture. It's even lit up right now! :) One thing I will say, I expected more smell from it, but it's still nice.. I think I'm going with the cool socks, lots of varieties and they can never go wrong. Yes, always last minute. These were some great ideas! I love socks and candles for sure they make a great gift! Everyone loves socks :) I followed your social medias! The first thing that I saw in the blog was the pizza... Nobody can top a pizza gift for xmas... FTW! This is a wonderful last minute guide! I love the idea of giving concert tickets, socks and headphones! Have a great week, Carmen! You can never go wrong with Beats by Dr. Dre! We got that for my brother for his birthday and it's his favourite till today! I'm the lazy type! I haven't even started my Xmas shopping yet. This year everyone can have pizza haha! I love that pizza is on here! To be honest, I would be over the moon receiving pizza - takeaway of course, so much better than shop bought! Uhm, pizza is a great idea. A giftcard to a pizza place or something. Brilliant and SO easy. Thanks for visiting my blog Carmen! Love this gift guide! 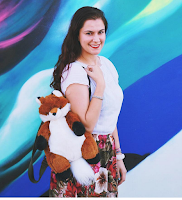 Thanks for visiting my blog Carmen! Love this gift guide. The wireless headphones are a great idea! Oh my god this is the best gift guide I've ever seen. Next year I'm just ordering pizza for everyone to be delivered on Christmas Eve. In all reality though, I definitely bought my best friend cool socks for Christmas this year. I bought them today. Lazy gift giving is my jam. This is a pretty awesome gift guide! I love the idea of just getting some pizza or any other food and just making a great night out of it. The keychain is pretty cute. I am too much of a control freak to wait to do my holiday shopping so I am usually done before thanksgiving, it makes the holidays a lot less stressful. Check out my gift guides if you have a chance. Thanks and Happy Holidays! You can never go wrong with socks! And pizza? GENIUS ! I would gladly accept pizza for a christmas gift. Love that phone case too! Oh my, the fact you put pizza makes me simultaneously laugh and fall in love with this post. Especially because it's so true, a pizza or a gift card or voucher for pizza comes in handy at the best times. Or if they are coffee lovers and Starbucks e-card is my go-to lazy last minute gift. Haha great list! You can never go wrong with pizza and a bottle keychain opener. : ) Cute socks, too! Those are really cool socks! and I love vans like that.